Amb. Hermenegilde Niyonzima of Burundi addressing the Security Council after its decision to extend the mandate of the UN Office in Burundi (BNUB) until 15 February 2014. The Security Council today extended the mandate of the United Nations political mission in Burundi for another year to support peace and long-term development in the country, as well as to redouble efforts to tackle corruption and allow people the freedom to organize ahead of the presidential and parliamentary elections in 2015. In a resolution adopted today, the 15-member Council authorized the mandate of the UN Office in Burundi (BNUB), consistent with the views of the Government of Burundi, to be extended until 15 February 2014. “We also talked about the way ahead, the role the UN can play, the role SRSG [Special Representative of the Secretary-General] Parfait Onanga-Anyanga and his team can play in helping the President, the Government and the people of Burundi achieve their aspirations for free, fair and inclusive elections,” Mr. Feltman had stated during the visit. Council members emphasized that more action is needed to prevent human rights violations, in particular ongoing extrajudicial killings, politically-motivated killings, mistreatment of detainees and torture, and restrictions on civil liberties, and urged that those responsible are swiftly arrested and brought to justice. They noted the importance of enhancing capacity among national security services and the police through training on human rights and sexual and gender-based violence. The Council also urged the Government to work with its international partners to support the National Independent Human Rights Commission and the Office of the Ombudsmen, and to strengthen national civil society. The current UN political office in Burundi was set up in 2006 to assist efforts towards peace and stability after decades of factional and ethnic fighting between Hutus and Tutsis killed hundreds of thousands of people. The resolution urged the Government, with BNUB and partners, to establish transitional justice mechanisms, “including a credible and consensual Truth and Reconciliation Commission to help foster an effective reconciliation of all Burundians” in accordance with the 2009 national consultations, as well as the 2000 Arusha agreement. The Council has also requested a briefing on the situation in the country by the end of July. In the meantime, Secretary-General Ban Ki-moon has said he intends to field a strategic assessment mission to enable further consideration of the future UN presence in Burundi. 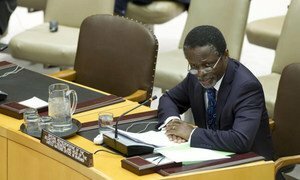 Burundi continues to make steady progress in strengthening governance and recovering from recurrent strife, but given persistent political tensions and poverty, support from the international community is still required, a United Nations envoy said today.